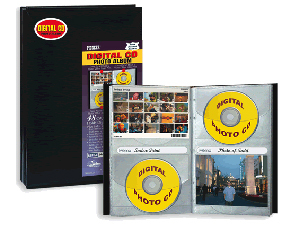 Holds 48 CDs, DVDs, 4x6 photos or index prints. Post binding accepts refills. Bonded leather cover and removable memo labeling strips with index tabs. This Pioneer Bonded Leather Photo Album comes with 12 pages to hold up to 48 digital photo CD's, DVD's, 4x6 images or index prints.